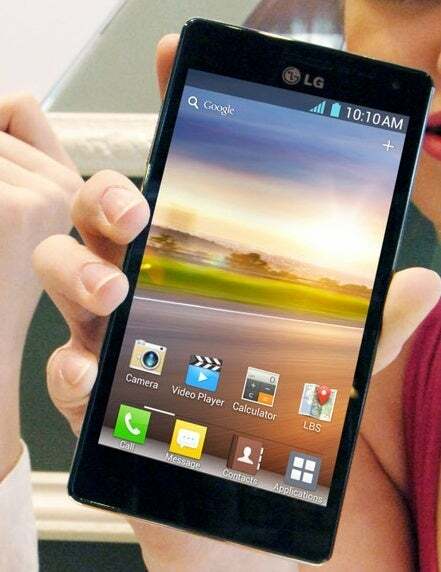 The LG Optimus 4X HD ($560 unlocked; price as of 7/5/12) is LG’s first foray into the quad-core world. Announced some four months ago at the Mobile World Congress, the 4X HD is powered by an Nvidia Tegra 3 processor, but that’s not its only highlight. It also has a 4.7-inch display with a 1280-pixel-by-720-pixel resolution. The Optimus 4X HD is currently available in Europe and will arrive in Asia, South and Central America, and Russia in coming months. So far, LG hasn’t announced any North American availability for the 4X HD. LG’s Android phones haven’t been wildly successful here in the United States, but this model has what it takes to make a splash in this country. The Optimus 4X HD is superthin at 0.35 inch; however, it isn’t going to win any awards in the beauty department with its sterile look, rigid rectangular shape, and textured plastic battery cover. We received a white version for review; it's much more attractive than the black version I saw at the Mobile World Congress. The 4X HD has what LG is calling a “True HD IPS” display. Blacks look very deep, colors vivid, and whites bright. The screen does suffer from oversaturation, though, as our color-bar and grayscale tests showed. In our color-bar test, colors bled into each other; in the grayscale test, we had trouble differentiating the light-to-dark shades from one another. We’ve found oversaturation to be a fairly common problem across multiple phones. But saturation isn’t always a bad thing. We've already mentioned the good colors. Details usually were also quite sharp in photos, but text rendering wasn’t perfect. Sometimes text looked a bit pixelated and fuzzy when viewing certain websites. But for gaming, video-watching, and casual Web browsing, the Optimus’s display is excellent. Debate rages over wheter quad-core processors are needed on mobile phones. Some argue that too few apps are optimized for a processor that powerful. Others argue that quad-core isn’t necessary on such a small device. But one area where the power of quad-core is abundantly clear is in gaming. I ran a few graphics-heavy games on the 4X HD, like ShadowGun, World of Goo, and Osmos HD. The games played smoothly and looked terrific on the 4X HD’s display. When it comes to mobile gaming—especially games with 3D graphics—Tegra 3 phones have an advantage. The PCWorld Test Center measured the 4X HD’s battery performance by playing a video at full brightness with the audio set at maximum volume. The video file is a high-definition video that plays at 720p continuously in a loop until the battery gives out, at which point the total battery life is logged by either our automated timer application (on Android tablets) or one of our trusty testers standing by with stopwatch in hand. After two passes, the Optimus 4X had an average battery life of 6 hours, 28 minutes. The Galaxy S III had longer battery life by just over an hour (7 hours, 30 minutes), while the HTC EVO 4G LTE ran about a half hour longer than the 4X HD (7 hours, 4 minutes). I’ll admit that I’m not a fan of these manufacturer-built Android user interfaces. I think Android 4.0 is clean, attractive and polished—and doesn’t need anything extra added to it. But as much as tech reviewers and consumers complain, manufacturers are going to continue to slap their overlays over Android in order to differentiate their phones from the competition.